When the ice cream man showed up every Sunday, I always got one of two flavours (sometimes both) – Grape-Nut or rum and raisin. When I got older, Devon Stout became my favourite flavor but childhood was all about the Grape-Nut. I honestly had no idea what a Grape-Nut was and didn’t care. Grape seeds? Who knew? I didn’t find out that Grape-Nut was a type of cereal until I was an adult. Felice challenged us this month to make Bundts with cereal. This Bundt has been on my mind for years and I was so happy that I finally got to make it. Thanks for hosting a great theme, Felice! My only wish here is that the shop down the road had some Grape-Nuts ice cream when I stopped by. She had rum and raisin (not even the good kind but I’ll eat any ice cream you give me –shameless) so that had to do. Be sure to scroll down to see what other cereals my fellow Bundt Bakers are baking with this month. And P.S., it feels good to be baking Bundts again! Thoroughly a grease and flour a 12 cup capacity Bundt pan. Do it well, or your Bundt will stick. Cream butter and sugar well until light and fluffy. Add salt and mix well. Add the eggs one at a time, mixing well after each addition. Whisk together the baking powder and flour. In a separate container mix together milk, vanilla, and almond extract. Alternate adding the flour mixture and the milk mixture to the butter mixture. You’ll start with flour, doing 3 additions of flour and 2 of the milk mixture. Thoroughly combine and then by hand, stir in the Grape-Nut cereal. Bake 40 – 60 minutes or until a skewer inserted into the cake comes out clean. Cool for about 10-15 minutes and then invert onto a cake rack to cool completely. I used light brown sugar so you can try that instead of granulated, if you wish. I love to add Grape-Nuts to vanilla ice cream but I've never seen that as an actual flavor. I had no idea that it was a thing. Perhaps just in Jamaica? 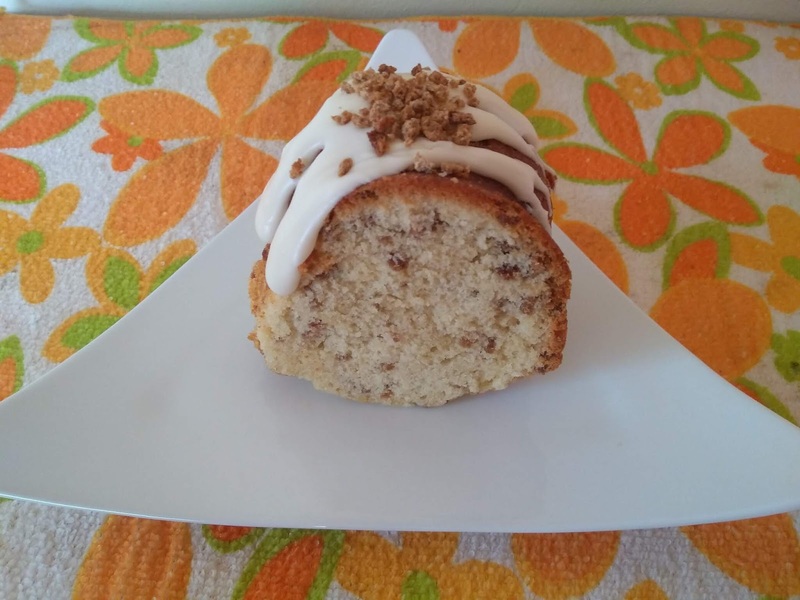 What a pretty Bundt with the frosting and speckles of Grape-Nuts inside! I'm glad you are back baking with us again too, Kelly! I have never heard of grape nut ice cream. I'm going to try making some this summer. Your cake is lovely. Grape-Nuts ice cream, who knew? Lucky for us you used it as an inspiration for this yummy recipe.